I have a few minutes while dinner comes along. Time for a quick post about the vaping status. 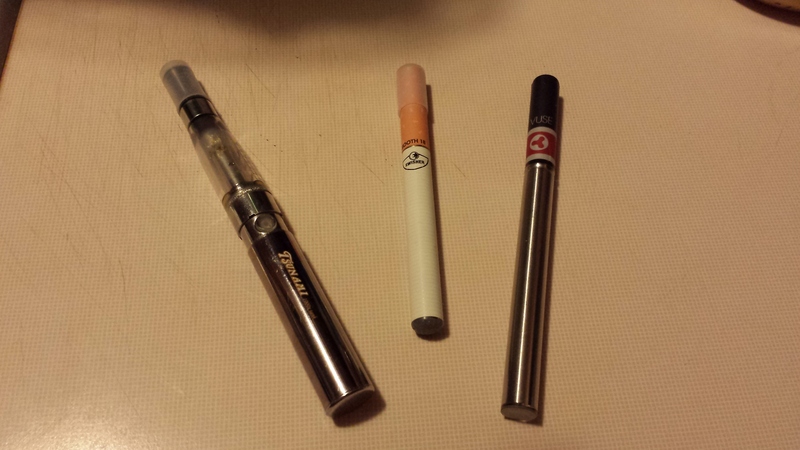 I have a confession to make: after using Vuse e-cigs for over a year, I lapsed back into burning “real” cigs. Yes, I know. Nasty. Smelly. Unhealthy. One thing the guy in the vape shop told me: people seem to lose the urge to smoke tobacco after a while of using e-juices with flavours other than tobacco. So I bought one bottle of tobacco flavoured just to get started, and I also have a fruity flavour (plum, actually) and one that sounds weird but I couldn’t resist it: custard & chocolate. Let’s see how this works out. I just realised that tomorrow marks FIVE MONTHS since I switched from “real” cigarettes to e-cigs. In all that time I’ve had only one lapse, at work, after a very high-stress couple of hours diagnosing and fixing a bug under an extremely tight deadline. We did it, but then I and my co-worker (who was also switching to vaping, but hadn’t quite packed in the tobacco at that time) stepped outside for a puff, and I scrounged just one cig off him. I won’t be doing that again—he smokes menthols. Five months. It doesn’t seem like that long. Does that mean I can call myself a non-smoker? Ex-smoker, probably. Vaper is the proper term, I think. And perhaps not even that for much longer—I’ve noticed that I don’t seem to be getting through as many Vuse cartridges in a week as I used to; my consumption of the things seems to be dropping without me even trying. I wonder what would happen if I actually made an effort to deliberately cut down on those now? For those of you that didn’t already know, I smoke. Not heavily—I’m not a brown-fingered fifty-a-day kind of guy—but I’ve been a smoker for a long, long time. To get back to the point, if you can’t stop being a miserable slave to the evil weed, you can at least try the e-cigs. Nobody’s going to say it’s as good as giving up altogether; it’s still nicotine, after all. But then, it’s just the nicotine. No smoke, no tars, no smelling like an old ashtray. And since most of the health problems associated with the coffin nails are consequences of the smoke and tars, surely the e-cig option is an improvement, right? So, I thought I’d give them a go, if only to try to reduce some of the health risks. Over the last month or three I’ve tried a couple of alternatives, and I thought I’d write up something of my results. The first one I tried was called a Tsunami. That’s the chrome and plastic one on the left in the photo. It seemed to work pretty well; you buy the liquid in little bottles and you fill the reservoir. The problem is that’s not always convenient (you can get some funny looks when you do that on your office desk, for example), and it can be messy. And it was relatively expensive—it set me back something like $65. But the big downside for me was that it just didn’t provide the kick a real cig does, and as a result I still had the craving to burn some real tobacco. But I was (and am) convinced that switching would be preferable to staying on the smokes, so when I saw the Swisher e-cig I decided to give that a chance. This is the middle one in the photo. This kind has a rechargeable battery (the white part) and a disposable cartridge containing the nicotine liquid (the tan part), and it looks like a slightly oversized cigarette; it costs about $20 and for that you get the battery, a handy USB charger and one cartridge. The end lights up red when you take a puff, and that tells you it’s working. When the light blinks, either the cartridge is getting low or the battery needs recharging. Cartridges just screw into the battery, making them a lot more convenient (and less messy) than the fill-it-yourself type. But again, I still wasn’t getting that kick, and I was beginning to think either I wasn’t doing it right (with e-cigs you need to take longer, slower puffs to give the heating element time to get up to temperature), or maybe I just hadn’t found the right kind of e-cig yet. The other day I happened across the Vuse, and I think I’ve finally found what I’ve been looking for. This is the one on the right of the photo. The chrome part is the battery, and the black part is the cartridge. The Vuse comes with a handy USB charger, so it’s very like the Swisher—but there are a couple of very important differences. First, at $10 for the battery, charger, and one get-you-started cartridge, it’s relatively cheap (cartridges come in packs of two for around $7, and they say one cartridge lasts about as long as a pack of cigarettes). Second, the light at the end lights up white instead of red. Big deal, I hear you say—but I haven’t got to the good part yet: when it blinks white, that means the cartridge is getting close to needing replacement, and when it blinks red, the battery needs charging. Knowing the difference means you don’t throw out a good cartridge by mistake when you only needed to charge the battery. Other e-cigs don’t make it easy to tell the difference, so while this might seem like a small thing it’s actually a huge benefit. 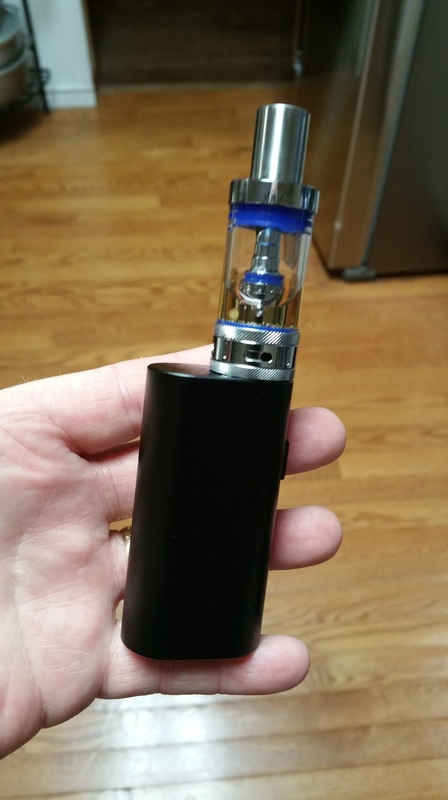 But the big, big difference is the actual vaping experience; the very first puff had a strength to it that the others didn’t, and I’ve found that it actually has enough of a nicotine blast to blow away the craving for a “real” cig. The downside: from what I’ve been able to find out, you can’t buy them outside Colorado (at least, not in retail stores—maybe you can buy them online, though). As I mentioned, I only found the Vuse the day before yesterday. So I’ll see how this goes, and I might write up a bit more in a couple of weeks to let you, gentle reader, know how it’s working out.